As you could probably guess by now, I have just uploaded my photos from my camera to my computer. Look out for baby Rachel photo overload in the next several posts. 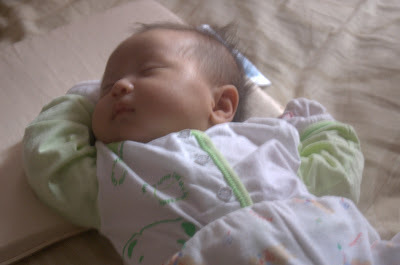 Today I will show you some photos I took of Rachel, and the theme is sleeping. When I took these photos, she was about 5 to 6 weeks old. 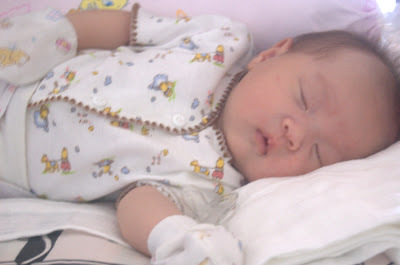 How I wish she can sleep so peacefully all the time! I took this shot as she was taking a morning nap in our living room. She’s so cute, sometimes I don’t want to go to work because I’ll miss her. In this photo she looks exactly like my sister Lydia. Rachel taking an afternoon nap in her baby cot in our room. We tried letting her sleep on her tummy to help her pass gas more comfortably. We got a Safe n Sound pillow with holes to prevent suffocation. Baby’s eyes. Some say looks like me, some say looks like Poey Chin. 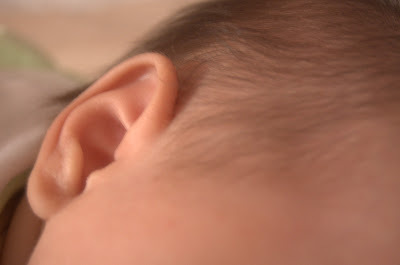 Baby has Poey Chin’s ears. Sometimes she smiles when she sleeps. I always ask her what she dreams about. She doesn’t want to tell me anything. Such serenity especially in her last picture.